This novel in verse is about Patches, a house cat who roams away from home. Although Patches enjoys the adventure and discoveries she makes in the outside world, she finds herself missing her owner and the safety of her home. The story starts off slow, but picked up halfway through the book. The story turned out to be a sweet tale about home, love, and unlikely friendship. 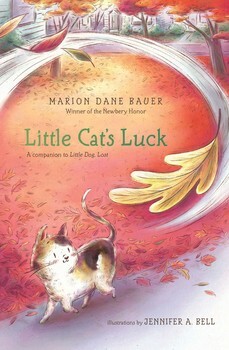 This is a companion to Bauer's Little Dog, Lost. Both are heartwarming stories and will appeal to pet lovers. Cedar is spending the summer in Iron Creek with her mother and younger brother, Miles, a year after her father and brother, Ben, were killed in an accident. Cedar is still dealing with her grief and the memories she has reveal the emotions she feels about the sudden loss she has experienced. A new friendship and the series of events that take place over the summer help Cedar work through her sadness and confusion. Condie has a style of writing that captures so much emotion; it's an engaging and meaningful story. They all sound good, & I've read an excerpt of Summerlost, know it will be well done. Thanks, Lisa. It's sad at times, but a great story of friendship. Summerlost sounds sad but lovely. Sad, but lovely is a great way to describe it. Both of these books look like great summertime reads! It feels like summer here in Ohio and I'm so ready to dive into some of these books. 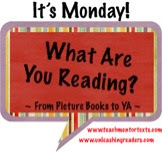 Have a terrific week! We had a day that felt like summer, too, here in MA. Not so much today! Looking forward to summer when I can get lots more reading done! The author uses concrete poetry within the book, too, which is interesting. Yay another novel in verse. I'll have to look for this one. This would be a good addition to a novel in verse collection, as would her previous book, Little Dog Lost. The covers of these books look very inviting. Will check them out. 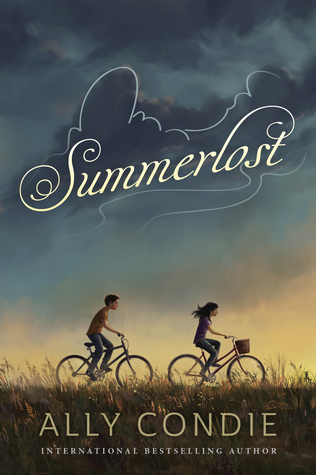 I just love the cover of Summerlost - I think it's why I first pulled it off the shelf.